Laser Therapy is used to treat and relieve pain, it uses the combination of red and infrared light to decrease inflammation and speed up the healing process that is associated with a person’s pain. This type of treatment is unlike some other kinds of physical therapy treatments that simply mask the pain you feel, laser therapy actually treats the reason for the pain and promotes the healing process. 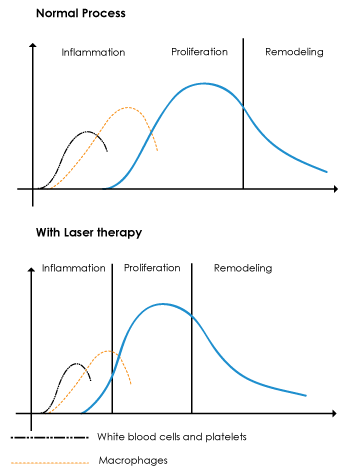 This is why in most cases laser therapy is more effective, more beneficial and lasts longer than other forms of physical therapy. When the light source that is used in laser therapy is held against the skin, the photons travel for several centimeters before getting absorbed by the mitochondria, which is the energy part of a cell. This form of energy adds some fuel to our physiological responses thus causes normal cell morphology and function. As a patient of laser therapy, you can expect to rest in a comfortable chair or on a cozy bed during your laser therapy treatment. It will be like getting a warm massage in a pleasant environment. In addition, you can feel confident that your cells will be rejuvenated during and after the laser therapy process, which means your pain will decrease tremendously and you will be able to live a full healthier life. To schedule a free consultation to see if laser therapy is right for you, please call 815-937-0446.